Instead of focusing on disappointing outcomes, we should consider viewing failures as opportunities to learn and improve. Failure. Not many people savor it or seek it out. But instead of focusing on disappointing outcomes, we should consider viewing failures as opportunities to learn and improve. One principle of agile software development is failing fast. Of course, the goal is not to aim for failure, but to recognize that failure is a necessary and beneficial part of the development process if you approach it properly. Research and development depends on iteratively generating, inspecting, and evaluating ideas, designs, and products. Great products aren’t miraculously conceived—they’re built, refined, and enhanced iteratively. 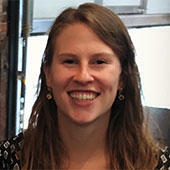 Professors from Teachers College, Columbia University, and University of Washington wanted to see whether exposing students to stories of the intellectual or life struggles of famous scientists such as Albert Einstein, Marie Curie, and Michael Faraday would impact their own scientific achievements. They found that the performance of students who heard stories about others’ intellectual or life struggles in science classes actually improved, unlike that of students who were exposed only to stories of successes. Detailed, personal, honest narratives drew the students in, humanizing famous scientists and enabling students to relate to them better. Students realized that achievement was not a result of innate talent and foresight, but a product of hard work, iterative refinement, and persistent motivation. We must not become wedded to our first ideas. Instead, we need to watch constantly for signs of failure and be willing to adapt and change our goals based on external feedback. Initially, his goal had been to create a multiplayer game, but the game was hard to explain to investors and didn’t prove commercially viable. So, instead of accepting defeat, he and his team decided to pivot and use the technology they’d built to create Flickr. Later, after Yahoo bought Flickr, Butterfield decided to try building his game once again. Instead of being discouraged by yet another failed attempt, Butterfield saw this letdown as an opportunity to reevaluate his goals and see how he could use their years of work and cross-functional skills in a different way. He acknowledged failure and used it to prompt reflection, deciding to pivot to a communications platform. And it worked. Slack currently has over six million active users daily; nine million on a weekly basis. Research plays a key role in recognizing and learning from failure. Research plays a key role in recognizing and learning from failure. An excellent example of the value of research comes from a startup at Stanford that wanted to fly cameras over farm fields to collect data about optimizing the distribution of water and fertilizer. Initially, they planned to build drones to collect this data, but after talking to potential customers, they found that there were already many aerial drone businesses within the US. So, instead of having to invest heavily in hardware engineering and developing drones, they could simply partner with established crop-dusting businesses. This startup learned the value of early research, saving millions of dollars and years of their lives. Because they did not get too attached to their initial idea, they were able to adapt based on their research, ultimately building their product for a fraction of the time and cost. Launching ideas and products early to rapidly get feedback from users, then iterating on failures to create successes. Frederik Pferdt, Chief Innovation Evangelist at Google, and Tim Brown, CEO of IDEO, discussed how they foster creativity within their organizations. Their answer? Launching ideas and products early to rapidly get feedback from users, then iterating on failures to create successes. There’s more to the equation though. If people are fearful of failure because of pay, promotion, or social penalties, innovation cannot and will not flourish. People need to feel secure and be able to try new things without fearing negative consequences. 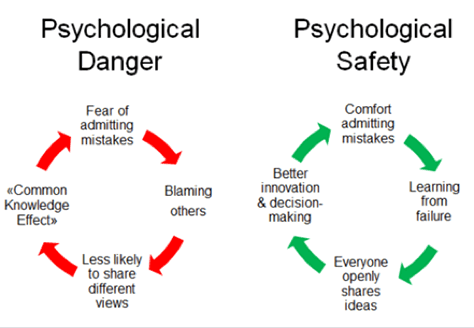 Psychological safety lets people admit their mistakes, learn from failure, and openly share their ideas, all of which lead to more innovation and better decision making. Thus, psychological safety lets people view failure as a learning experience, not a career-ending embarrassment, as Figure 1 shows. If organizations give people permission to experiment and share their ideas early on, they’ll receive critical feedback and iterate and refine their ideas. As Frederik Pferdt points out, “The faster you fail, the faster you learn. If you fail in a week, instead of a quarter, it feels more like learning than failing.” Instead of blindly pouring time and money into a project, invest in early research and feedback opportunities. We should acknowledge and publicize our failures, instead of sweeping them under the rug and pretending that we’re perfect. Rather than being paralyzed by fears of imperfection, we need to embrace failure—not as a possibility, but as a probability. By sharing our failures and what we’ve learned from them, we can help ourselves and others avoid repeating the same mistakes and embolden others to experiment, iterate, and refine their ideas and products. Organizations must cultivate psychological safety, letting people try things and fail without fear of losing their job or reputation. Then, by coupling our newfound confidence with user-centered research, we can solve complex problems and spur incremental, sustainable innovation. Blank, Steve. “How Startups Should Do Customer Discovery.” Medium, November 27, 2017. Retrieved March 14, 2018. Lin-Siegler, Xiaodong, Janet N. Ahn, Jondou Chen, Fu-Fen Anny Fang, and Myra Luna-Lucero. “Even Einstein Struggled: Effects of Learning About Great Scientists’ Struggles on High School Students’ Motivation to Learn Science.” (PDF) Journal of Educational Psychology, 2016. Retrieved March 14, 2018. Pferdt, Frederik, and Tim Brown. “This Is the Way Google and IDEO Foster Creativity.” IDEOU, 2017. Retrieved March 14, 2018. Smith, Ryan, and Stewart Butterfield. “An Interview with Slack CEO Stewart Butterfield.” (PDF) Qualtrics, 2017. Retrieved March 14, 2018. People can only learn from failure if they have the resources to reflect on those failures. What often happens in organizations is they have some sort of inquiry into the failure which takes weeks or months to complete and agree with the results. When they publish/circulate them, most people involved have moved on and are too busy to read and reflect on the report. The second point I would highlight is the importance of reflecting on success as well as failure. This is one of the foundations of the resilience engineering community. If something fails like 1 in 10000 times then it means it succeeded 9999 in 10000 times. So we need to learn from that too. I think that even schools train students to avoid failure at all. For example, you cannot fail when getting a grade, if so, you may fail the whole course. This does not allow a person to embrace failure in a proper way, and may end fearing the consequences. Mindset education is key to teach students that failure is not the end of the road but an opportunity to stand out and reach new goals.